Every year for Christmas I try and make Claudia a Christmas present. Sometimes it's a big success (an old laptop I turned into a digital photoframe that shows local bus positions, bike share station status and more recently streaming video from our baby monitor) and sometimes less so (a fish scale modified to set off a buzzer when pulled too far that was supposed to teach our dog not to pull on the leash). This past Christmas, my wife was pregnant so I decided to build something that would help us get through the late nights of breastfeeding. Claudia loves to read, and we now buy a lot of digital books, which Claudia reads on an old Kindle and I on my phone. I decided that I wanted to come up with a way that would enable Claudia to read hands free while breastfeeding our baby. Besides Kindles and phones, Amazon also lets you read books on their kindle cloud reader. You just go to http://read.amazon.com, sign in with your kindle account, and all of your books are there and ready to be read. When you put the browser in full screen mode, it makes good use of the screen. You can adjust the text size and spacing so that it is quite readable, even at a distance. Of course you can click an icon to change the page, but you can also use the right and left arrow keys to flip pages. With all of this in hand, the rest of my solution was pretty obvious. 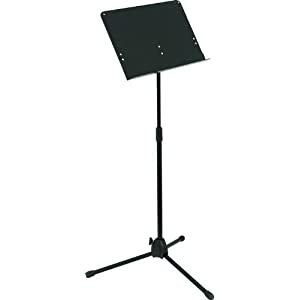 The music stand is adjustable to hold the laptop at eye level, is sturdy and easy to move around. 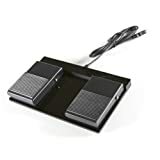 The foot pedals basically work like a keyboard with two keys. I used the included software to configure them so that the right pedal would send the right arrow key, and the left pedal would send the left arrow key. Needless to say, I was pretty psyched when I plugged it all in, went to the read.amazon.com and everything worked perfectly. Now that Annika, our little baby girl, has arrived, my wife is using the system around the clock and it seems to be working flawlessly. With the background color set to black, it barely even lights up the room, which is helpful when you are trying to keep the baby in sleep mode. Still one thing begs for more details, namely "an old laptop I turned into a digital photoframe that shows local bus positions, bike share station status and more recently streaming video from our baby monitor"